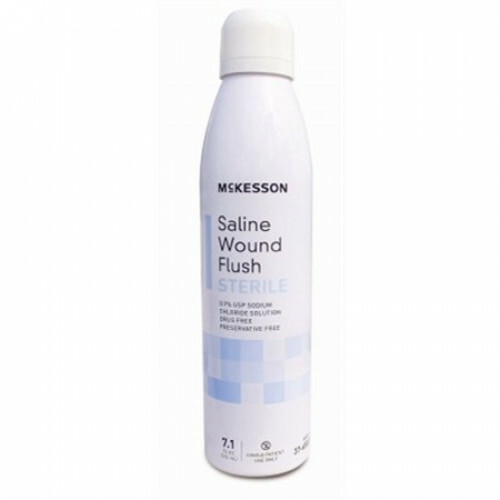 Mckesson Wound Wash, BUY Wound Wash Saline, Wound Flush, 37-6507. Wound Wash Saline, manufactured by Mckesson, is a multipurpose normal saline that is perfect for flushing out wounds with a sterile .9 percent sodium chloride solution. Wound Wash Saline Solutions are designed to moisten dressings, clean cuts, and burns. The convenient single patient packaging makes this Wound Flush easier to use than large bottles of Sterile Saline. Unlike some other Wound Cleansers, Mckesson Wound Wash uses a sodium chloride solution that contains no preservatives or other drugs, reducing the risk of reactions. Mc Kesson wound wash is good; but it does not last long. Found it to work well but it does not last long at all. Decided to try another wound walk in a pump spray bottle. Saline wound wash is better than soap and water, because soap can have bacteria growing on it. That is not the type of thing you want in a wound.